In our big kid crowd. We don’t mean to scare. I know. You’re stunned by my genius aren’t you. I give you permission to use this if you decided to throw your own “Big Kids Boo Bash”. Yes, that is what I’m calling it. And yes. I’m aware that I’m a gigantic nerd. After I sent out the invites, I started browsing Pinterest (my latest online site obsession) for decor and food ideas. I can’t believe all the cute and amazing things people are coming up with! I’m blown away. Anyway, that just made me more excited and so I made my way to my nearest Dollar Store to see what I could come up with. Can I just say again how much I LOVE THE DOLLAR STORE. It is a magical place. 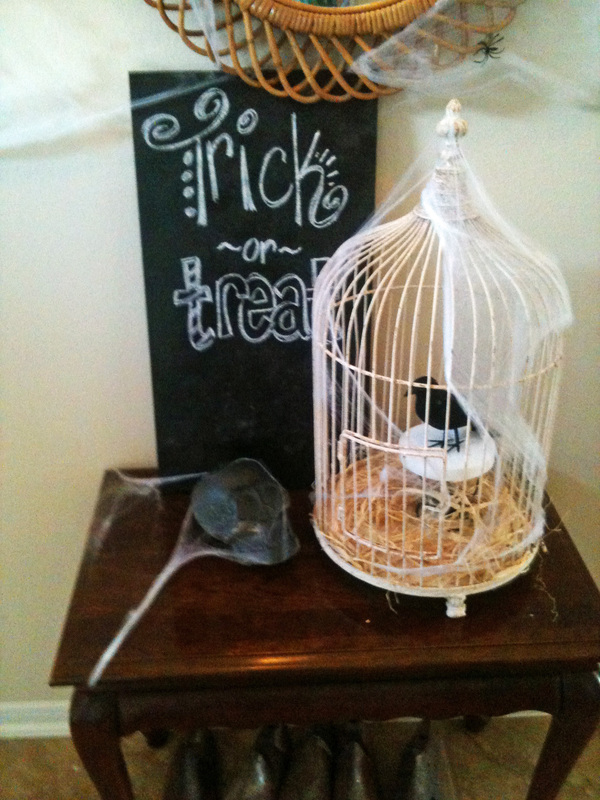 Especially for Halloween items. I found tons of decor and serving wear for my party and it was cheap cheap cheap. I got home and got to work. 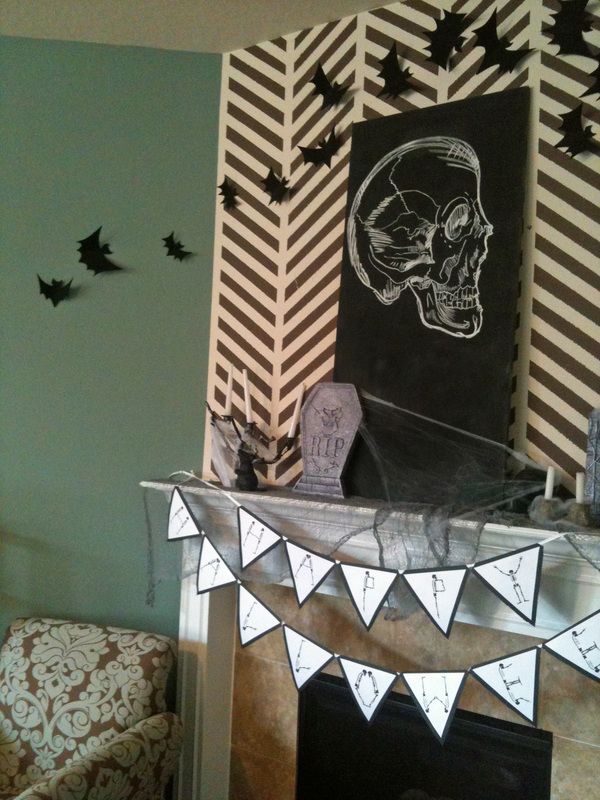 Even though my party is a couple weeks away still, I couldn’t wait to get the decorations up. I’m totally in Halloween mode now. I even found costumes for my hubby and I (he is going to be a scarecrow and I’m going to be a crow) at the thrift store this weekend with my sis-in-law Courtney. I seriously want to just live in costumes for the rest of the month, thats how excited I am. 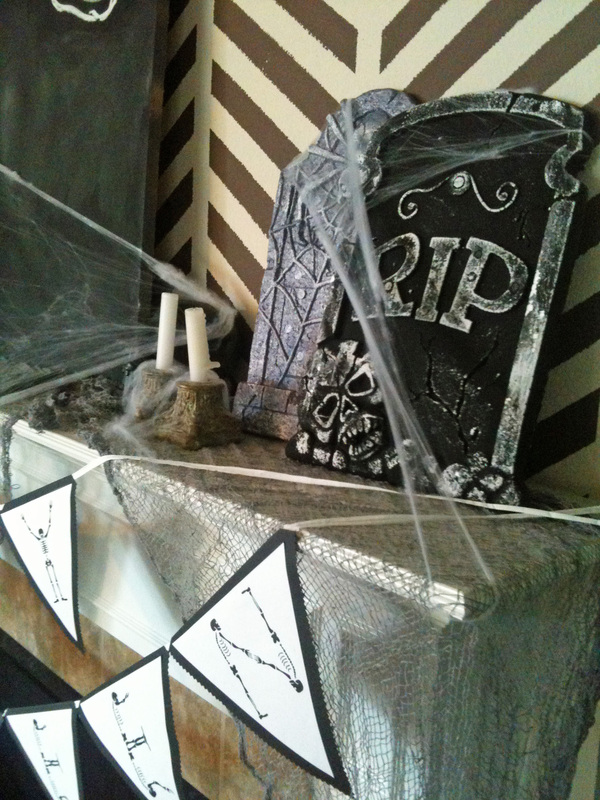 Anyway, would you like to see my decorations so far? 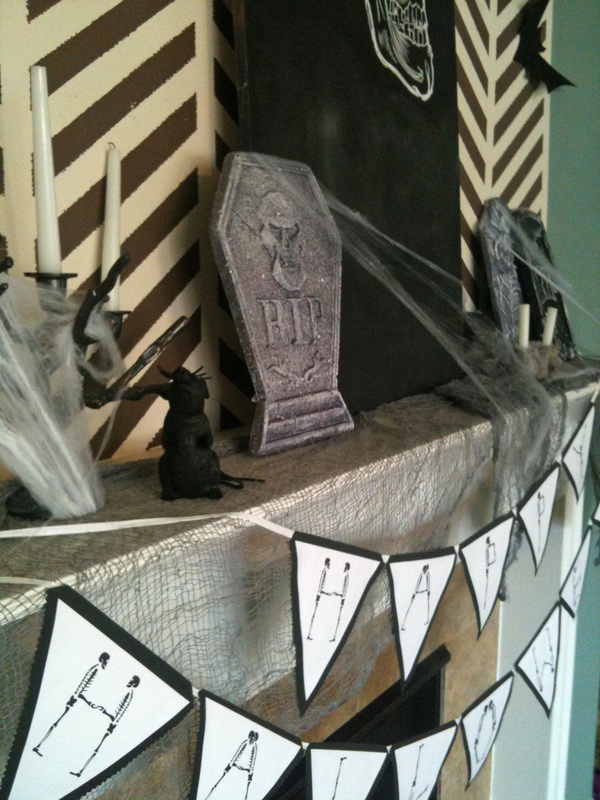 I used a lot of what I already had with a few things I made and several things from the Dollar Store. 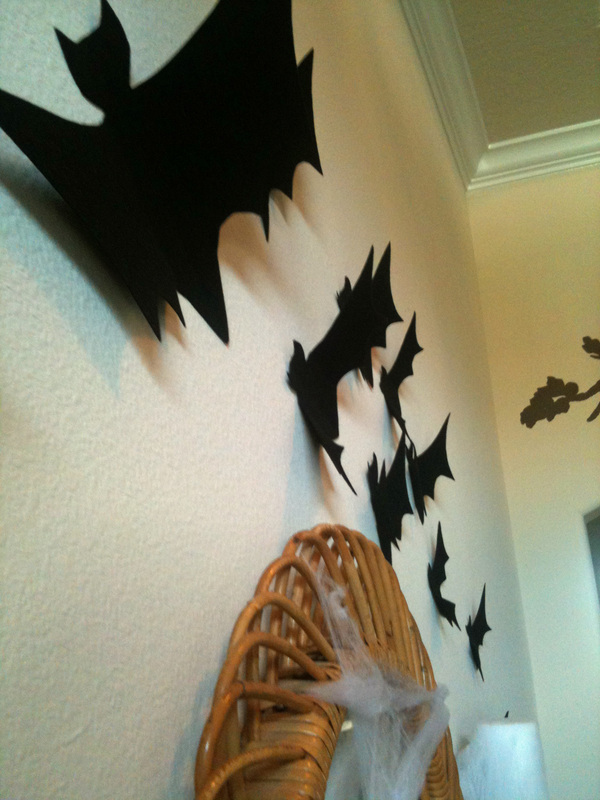 I made the bats by folding sheets of stiff black felt ($0.99 at Hobby Lobby) in half and then cutting out a bat shape (half a bat shape). Then I folded the wings out and attached them to the wall with sticky tack. Easy peasy and I LOVE it. I made larger and smaller bats. I didn’t use a template, but if you wanted to find one, just google image search “bat silhouette” and you’d find plenty. 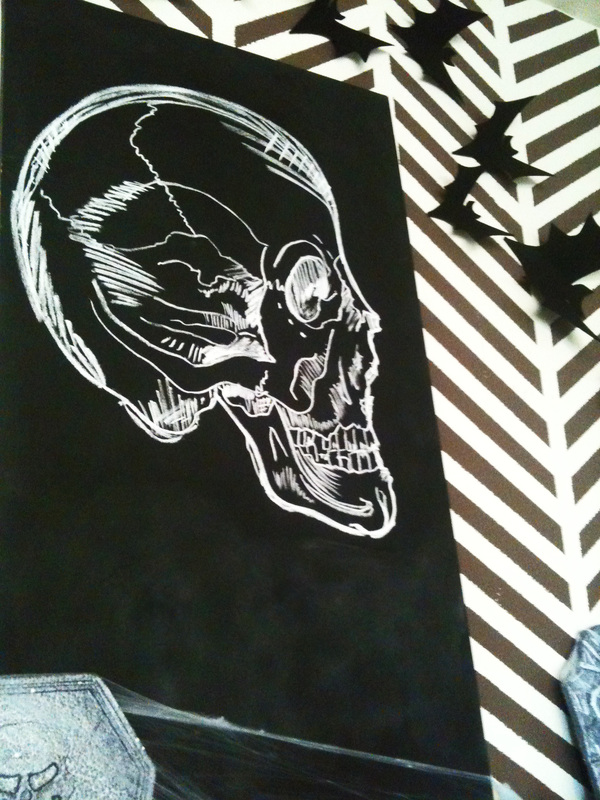 I sketched the giant skull profile onto a black painted piece of mdf I had in the garage. Its in white chalk so I can change it whenever I feel like. I eyeballed it from an image I found google image searching “skull”. Peyton calls it a “bone-head”. Haha! 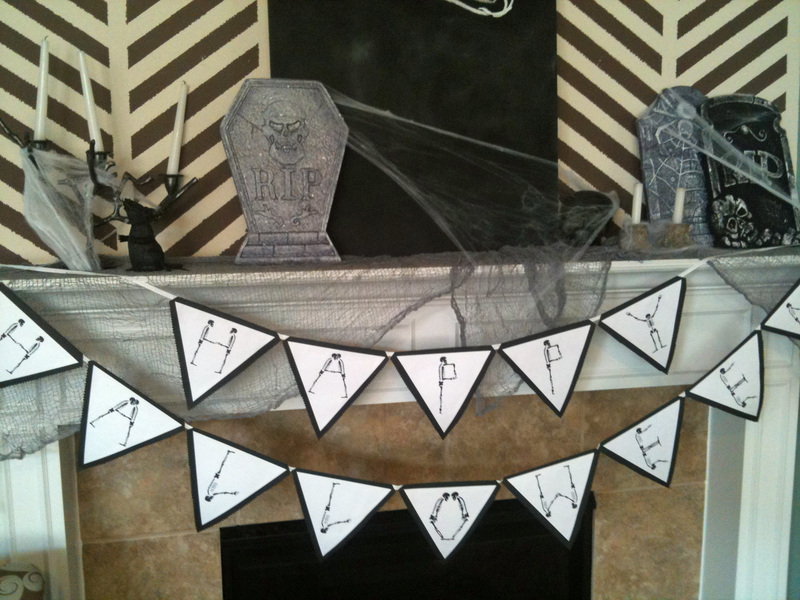 The Happy Halloween bunting banner I made from my bunting template and Picnik. I LOVE the skeleton font. So great. 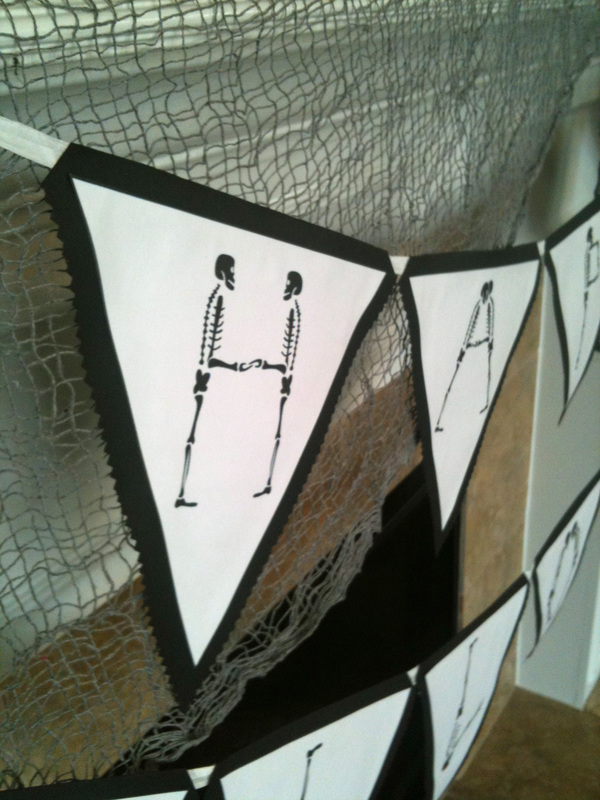 I printed them on white cardstock and then cut them out and glued them to black cardstock bunting I cut out with pinking shears. 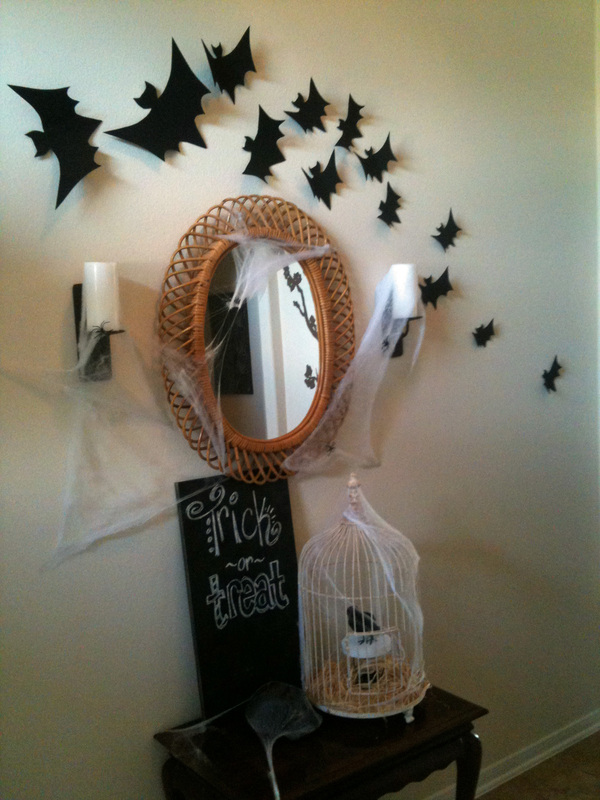 Then I attached them to white paper ribbon I bought at the Dollar Store. 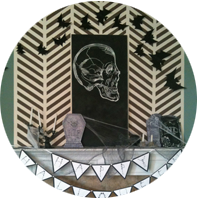 The tombstones, spiderwebs, skulls, and creepy cloth all came from the Dollar Store. 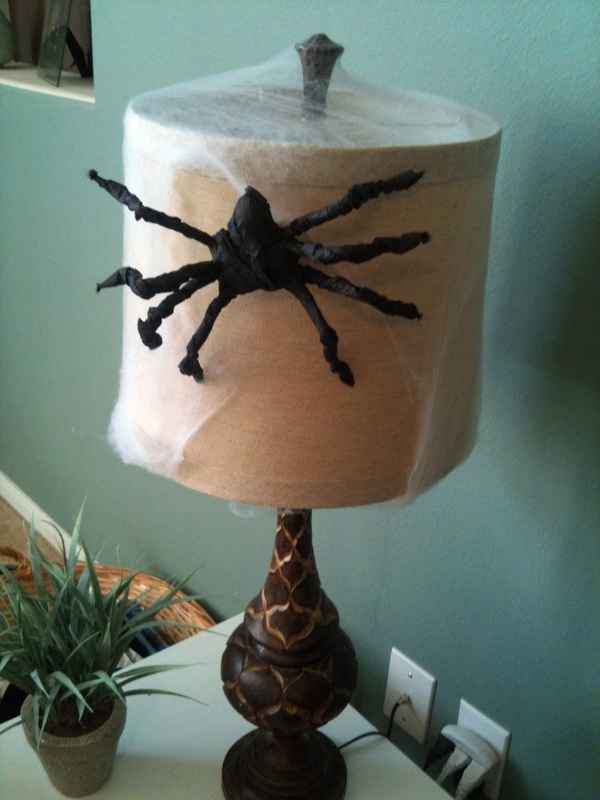 I also made these big spiders out of crepe paper streamers and pipe cleaners. I want to make a bunch more and have them crawling up my curtains in my living room. 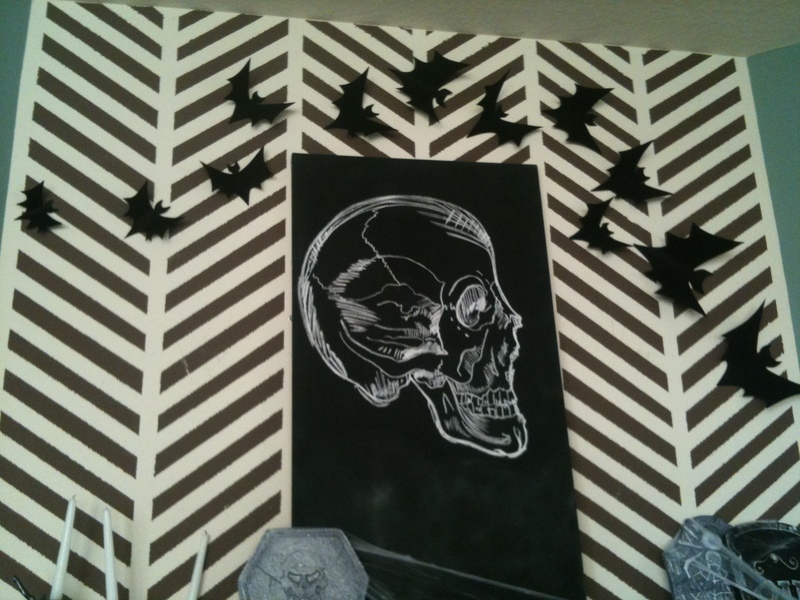 Heres a quick look at my entryway. 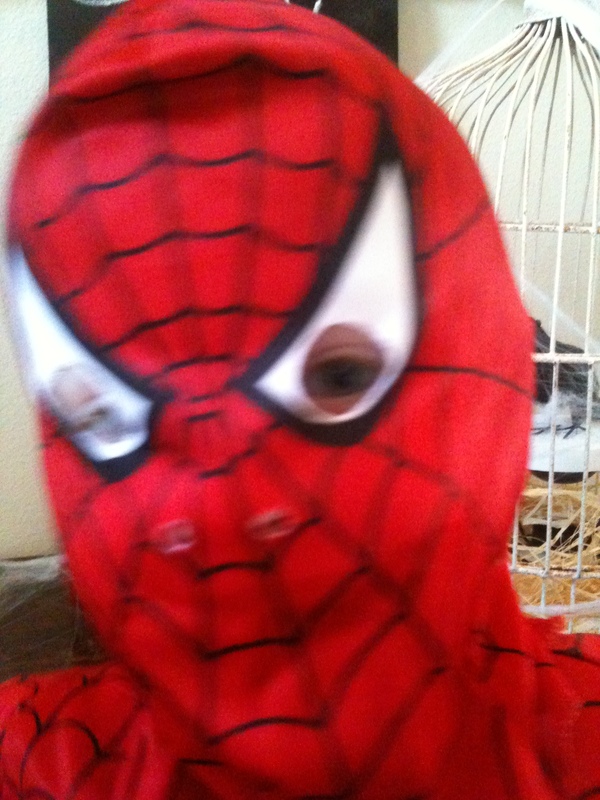 Then Spiderman (aka Peyton) popped in to say “hi”. And heres a closeup of my felt bats. Pretty creepy huh?! I’m super excited and can’t wait for the party. 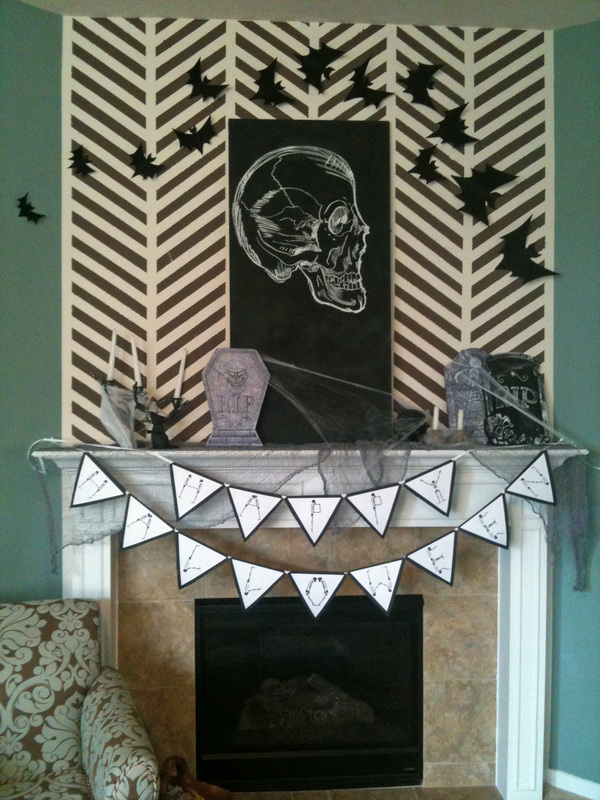 Check out my next post for all of my FREE HALLOWEEN PRINTABLES I made for the party!!! :) BOOOOOOOOOooooooooo!